The book starts off with the Bright family losing their youngest, an infant baby boy, and moving to Philadelphia for the father to join the family business as undertaker. The family all lives in the house attached the the funeral home, providing a unique perspective into the horrors and harrowing tragedy of the Spanish flu. 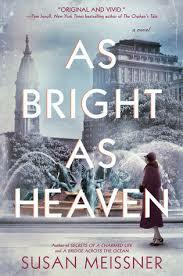 I'll be honest; I knew embarrassingly little about the Spanish flu before reading this novel. I had no idea how devastating it was. And I think that's what makes this book so beautiful: in a near-apocalyptic world of a fatal illness, people still choose what's good even when it's hard. The mother, for instance, chooses to go feed the sick even if it means catching the flu. She is strong for others--her family and even strangers--even when she's weak. And she's fiercely protective of her daughters: "I do not fear Death for myself, but I will not allow its cold fingers to touch my girls. Not even in a slow caress. They are mine, I whisper." The tragedy makes the characters re-evaluate their priorities and their humanity, and those who survive the flu have to learn to live after such great loss. How do you rebuild and move forward after so much sorrow? The tragedy shapes each character, and I enjoyed watching them grow through the experience and struggle with difficult choices, and seeing how their stories develop and intertwine: "We only see a little bit of our stories at a time, and the hard parts remind us too harshly that we're fragile and flawed. But . . . your story isn't all hard parts. Some of it is incredibly beautiful." The perseverance of the human spirit when faced with darkness is truly amazing: "We adjust to [change]. Somehow we figure out a way. We straighten what we can or learn how to like something a little crooked. That's how it is . . . we keep moving, keep breathing, keep opening our eyes every morning, even when the only thing we know for sure is that we've alive." Overall, this book was stellar: excellent characters, fascinating plot, a sweet romance, and great writing style. I will be looking to read more books by the author. "This flu is like a black shroud that has been flung across everything that breathes under the canopy of heaven." "Our humanity is what made what happened to us so terrible. Without it, nothing matters. Nothing is awful. But nothing is amazing either."